Dundee’s North End Park witnessed a hugely exciting, and tense, cup final as Ferry Athletic prevailed against Montrose YFC 1-0. The game’s only goal came in the final minute of extra time, courtesy of an exquisite shot from Stewart Hogan. Though the game wasn’t packed with goals, it really was a fantastically well-contested affair and made for superb viewing. Ferry Athletic came straight out of the blocks at the start of the game and created the first clear chance. Luke Queen was able to break free of the Montrose defence early on, rounded the goalkeeper, but was only able to fire his shot over the bar. Shortly afterwards Queen threatened once again. Ferry’s electric forward attempted a looping shot at goal but, like his previous effort, it went over the crossbar. In the 10th minute Ferry started to build the pressure once again. Their work culminated in a chance for Findlay McLean but his effort flew over the target. After weathering the Ferry Athletic storm, Montrose started to find their way back into the game. The impressive Mitchell Smith made a fine driving run through the centre of midfield, in the 29th minute, before laying the ball off to Kai Henderson. Montrose’s number 14 hit a powerful strike, but it kept on rising and soared over the goal. A minute later Henderson had another attempt on goal as he fired a long range effort towards goal. The shot, however, was comfortably claimed by Ferry goalkeeper, Thomas Egan. The final chance of the first half came the way of Ferry Athletic. Shortly before the break they were awarded a free kick just outside the penalty area. Jackson Dobbie stepped up to take the kick and delightfully curled his effort towards the top right hand corner. It seemed destined for the goal but standing in the way of Ferry taking the lead was Montrose’s captain, and goalkeeper, Ross Duncan. Montrose’s number 1 expertly parried away the ball and out for a corner kick. 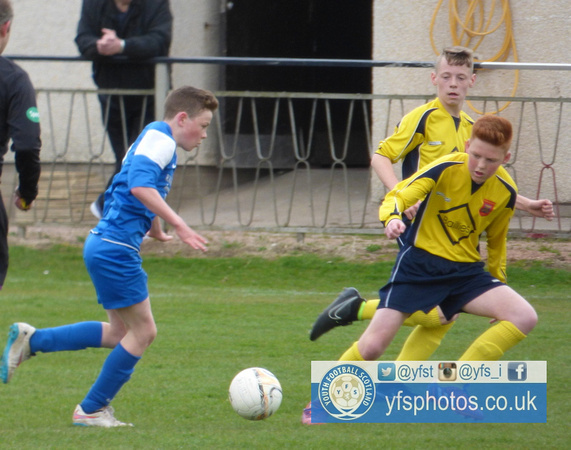 In the initial stages of the second half it was Montrose who started strongly. Mitchell Smith unleashed a fierce low shot in the first minute of the half but it travelled just wide of the post. Shortly afterwards Smith looked dangerous once again as he prodded the ball ahead of him before breaking free of the Ferry Athletic defence. Egan was alert, however, and ran out to claim the ball before Smith could reach it. In the 51st minute Montrose came agonizingly close to breaking the deadlock. Kieran Walker broke free of the defence and looked to slot his shot beyond Egan and into the bottom left hand corner. Egan had other ideas, however. The Ferry Athletic ‘keeper thrust out his right foot and made a superb save to deny Walker a goal. Ten minutes afterwards Henderson had another opportunity at goal. Cutting in from the left wing he curled his effort towards goal but Egan was on hand to claim the ball. Shortly before full time Montrose’s Dylan McDonald had another attempt at goal for Montrose. Once again, however, Egan was able to grab the ball and keep it. As the full time whistle went both teams were left to regroup and get ready to battle it out for a further 20 minutes. The first opportunity in extra time fell again to Montrose’s Henderson eight minutes into the first period. Smith expertly weaved his way through the midfield, evading several challenges, before laying the ball off to Henderson. The number 14’s shot drifted just wide. A minute after Montrose came as close as you can to scoring. Henderson delivered a free kick into the penalty area and it was met at the far post by Walker. The number 8’s header crashed against the crossbar and back out into the melee in the 6-yard box. The ball was eventually diverted back at goal but was plucked out of the air by Egan. In the second period of extra time Ferry also had a golden opportunity to grab a goal when Owen McCord latched onto a great cross a few yards out of goal. Unfortunately for McCord his effort was inches over the crossbar. As the game approached the end of extra time Henderson came close again for Montrose. He cut in once more from the left wing, and fired at goal, but Egan parried the shot back out. Walker looked to fire in the rebound with an exuberant overhead kick, but the connection wasn’t as he would have wished, leaving Egan to clean up the situation. With seconds left on the clock the deadlock was broken. Ferry Athletic were awarded a corner kick late on and they made full use of it. The ball was delivered straight into the box and was met by Stewart Hogan, who unleashed a sweet and powerful strike straight into the top right hand corner. As soon as his thunderous strike hit he back of the net North End Park erupted with noise. 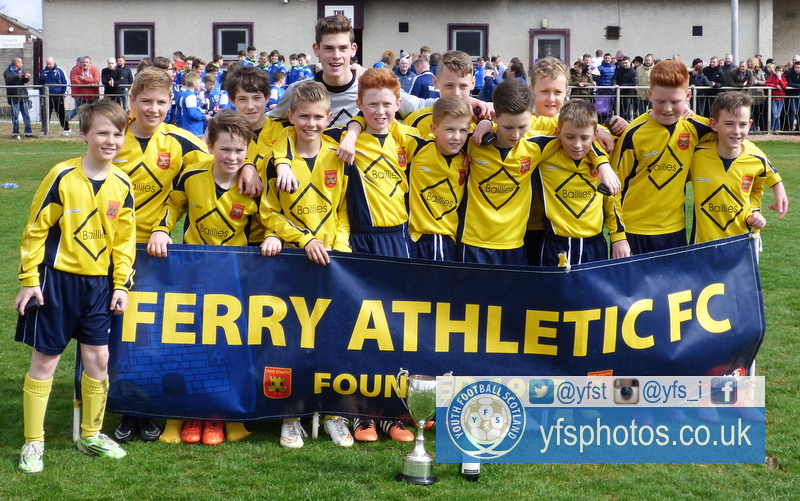 Ferry Athletic were seconds away from winning the Ross Ballantine Cup. Montrose tried to push in the little time that remained but in the end they were beaten by the clock. The referee blew the final whistle and Ferry Athletic could celebrate their victory properly. This win was built on hard work and Hogan’s goal was worthy of settling any cup-tie. Both Ferry Athletic and Montrose were fantastic on the day and if the final were decided on performance the game would still be level. For Montrose they need to build up their confidence again after this disappointment and get themselves ready for the final of the Diamond Jubilee Cup soon. The day belonged to Ferry Athletic, however, and they can be proud of being worthy winners of the Ross Ballantine Cup. Luke Queen – Worked extremely hard for his side up front to create chances and looked very dangerous. Worthy mentions go to Stewart Hogan, for the winning goal, and to William Baynard, who executed several key tackles to perfection. Kai Henderson – Had a number of great opportunities for his team and was pivotal in the game. Worthy mentions also go to Kieran Walker and Mitchell Smith, both of whom contributed excellently to the attacking side of Montrose’s game. Stewart Hogan’s goal – Has to be really doesn’t it? A sweet strike from Hogan. What a way to win a cup final. Walker’s extra time chance – A thunderous header that smashed off of the crossbar. A few inches lower and we could well be talking about an entirely different game.